Hello, and welcome to the language of Actionscript 3! Now I'm pretty sure all of you reading this page, are the ones who already want to learn how to use the language… but just for those who don't, let me breeze over why I have found Actionscript 3 to be such a great contribution to my programming knowledge. It's Fast. Compared to many other languages, Actionscript 3 is very very quick. Not as quick as C++, of course. But very quick for how easily it lets you do things. It's Clean. Actionscript 3 is easy to write, and it makes logical sense. Learning how to use new things isn't hard, once you get down the basics. And the method names aren't 20 letters long… unless you make them that long, that is =). It's Useful to Indie Development. Actionscript 3 does an enormous amount of things in just a small amount of code. It is built to be easy to use for the independent developer (though teams can use it too). Just because you are a team of one, doesn't mean you cannot learn and develop successful applications in Actionscript 3 successfully. Now those three reasons are the reasons I would use Actionscript 3. A few things to know about the language though, a few cautions, before you go ahead and start. Actionscript is useful for projects that use Graphics. If you are planning to do something with Databases, or Servers, it is probably best that you use another language in the main-time. Actionscript 3 is just getting into the areas of 3D, and has been in the areas of websites, gaming, and app development for a long time. So if you want to develop in one of these categories, Actionscript 3 is for you. Actionscript 3 is very picky on the code you use. You will get errors. Be patient. Ask questions. Talk on the Discussion Board. Or use the Game Development Room chat to get real time answers to your questions. Actionscript 3 is not a 'big cash' language, usually. Small projects take weeks to a month or two, whereas large projects take many months. Sponsorship gives you good money, but not a lot of money, and is very difficult to get when you are not a reputable developer. It is possible to earn a living off of programming in Actionscript… but it is very difficult, and takes a lot of frugality. As for being a hobby… Actionscript is great for that. One of the great things about Actionscript… is that you can program in it for free. 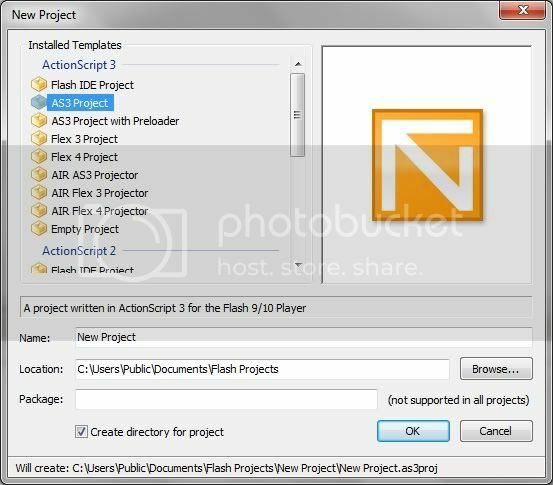 There is an excellent program, which I recommend to all Actionscript 3 Developers out there called Flash Develop. Now before I get you all excited… first you have to have Windows in order to run the program… sorry Mac/Linux users… but hey… if you have a spare copy of Windows, you can run it on a Virtual Machine and program there, if you would like. In any case, if you are unable to do this, but have Flash Pro, feel free to skip over this tutorial. Back to Flash Develop. Now what is great about this program? Two Words: Auto Complete. Auto Complete will halve your programming time, once you get used to it. Basically, Flash Develop attempts to recognize what you are typing before you type it, and once it recognizes the right thing, you press Enter, and there you go, you have it. There are other great things about Flash Develop of course, but that is the main selling feature. Now, if you have Flash Pro (from Adobe)… don't just go and throw it away yet, either… it comes in handy to for other things. But whether you have Flash Pro or not, be sure to download Flash Develop, it is well worth your while. 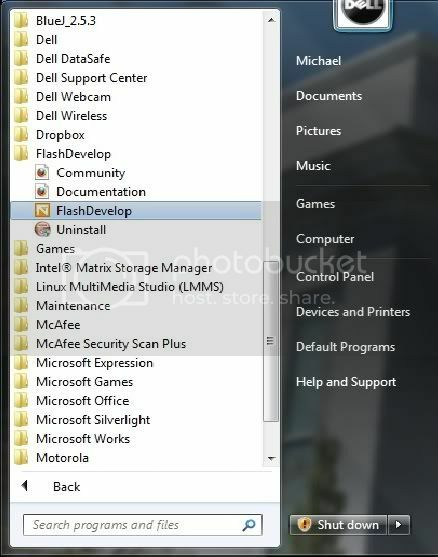 So first, let us start off then, with a step-by-step walk through on how to download, set up, and use Flash Develop. First, we go the Flash Develop Main Page. Then, if we look to the left, we see a box that says the latest download, and then has the text "Release notes and download." (see picture to left). Let us click on the link in that box, to take us to the download page. Anyways, so click and download it. However, do not open the downloaded file yet. We have a few more things to download before it is fully functional first. Next, we have to download the Microsoft .NET framework version 2.0. You can download it here, although you should probably check that you don't have it already. After that, we need to download the Java JRE. 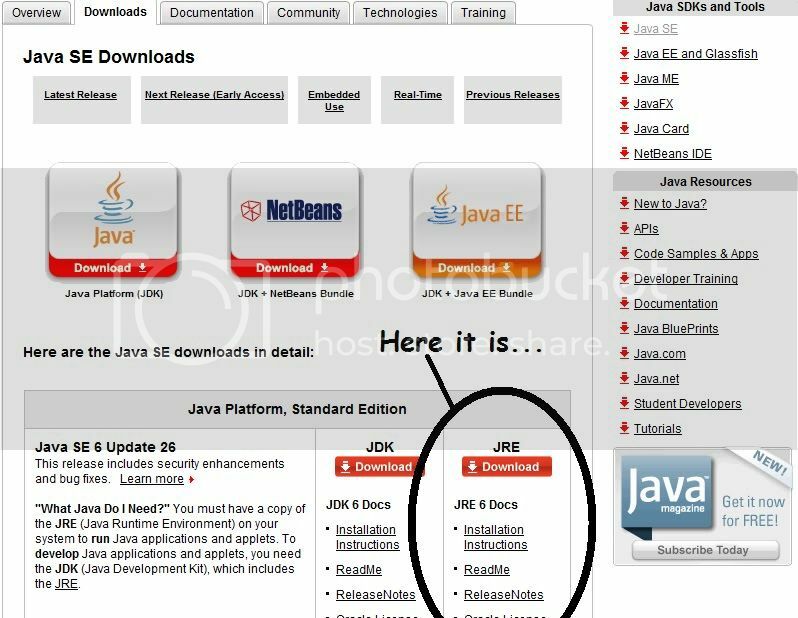 For some reason, Flash Develop needs this to run… supposedly it helps with the auto-complete… in any case, you can download the JRE here, just click the link shown in the picture below. Yay, now you finally have all the tools downloaded… you should see the icons from what you downloaded on your desktop. Next, open each of them, one at a time, except for the Flash Develop package. Do not open the Flash Develop package yet. Once you have opened each of the other packages, open the Flash Develop package. Follow the guidelines given to you there… the default options for most things should be fine. Once you are done with this, the program should appear in your menu (picture on the left). It may also be in various other places, depending on the options you selected during setup. One place I like to keep it though is on my quick referenced toolbar, on the bottom left, besides the Start/Windows Button that opens the menu. In any case, you can click any of these places to open the program when desired, so use whichever one works best for you. From this option screen, select 'AS3 Project'. Then, give your project a name (isn't required to be the name of your app, it is simply the name of your folder in the file sub-directory). Make sure 'Create Directory for Project' is checked, and that your Location is set to the place where you would like your project to be. Then finally, click 'OK'. That should set you up, so that way, you are able to code in Flash Develop. I hope you liked this tutorial, and if there is anything I can make more clear, please post it in the forum, and I will do my best to clear things up =).